The safety of any camp depended on the vigilance of its warrior class. A guard would be enlisted to ride out from camp and patrol the surrounding area watchful of any sign of enemies, checking for game movements and making sure that horse herds were not permitted to drift too far off. 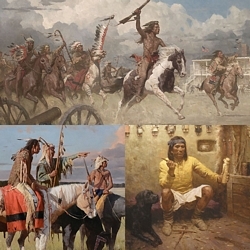 Riding a sure-footed horse was essential to the survival of any Plains warrior. The arrival of the horse in 1540 and the unprecedented power it presented forever altered tribal life. Soon, raiding horses was the dominant method through which Indian men could attain social recognition, advancement and wealth. In the midst of his watch, something out of place has caught this man’s eye; flushed birds, a swirl of dust or perhaps even a fleeting figure at the wood line. Who or what has entered his tribe’s domain? The "Suspicious Sight" by Z.S. Liang is an elegant yet powerful portrait of Plains Indian life. It captures the serene beauty of the bond between a man, an animal and the land while intimating the potential danger of the unknown that lay just beyond our view in this tranquil scene.